Children at ASU’s Mary Lou Fulton Teachers College Preschool are playing with blocks and making art projects, in addition to learning new ways of thinking about the world around them. These young students have pretty big ideas about recycling, turning off water while washing their hands and packing lunches that don’t generate a lot of waste. “We work to support the development of empathy and positive social interactions for young children," said Allison Mullady, preschool director. "Our staff and leadership team create research questions based on our day-to-day experiences. We seek out partners, create projects and collect data on the ideas impacting our children. The Sustainability Science Education team is creating unique sustainability education experiences for many teachers, including those at the preschool. This team is led by Lee Hartwell, ASU-affiliated faculty and Nobel Prize recipient (in physiology); Annie Warren, director of research and development at ASU’s Biodesign Institute; and Leanna Archambault, associate professor at Mary Lou Fulton Teachers College. “Children are incredibly observant. Providing unique opportunities to young kids, such as cleaning glitter-infused water with sponges, provides a creative way for them to draw connections to events like oil spills. Exploring these issues at a young age provides a necessary foundation for the critical consumption of knowledge in the future,” Warren said. The preschool often partners with other entities to enhance the education and opportunities provided to students. A recent “Preschool Yogis” study with the College of Health Solutions allowed staff to review how yoga impacted the children’s self-regulation and problem-solving skills. During an eight-week project, teachers and parents reported an increase in the use of breathing strategies and other yoga techniques among children. The adults reported that the preschoolers reminded each other about the breathing exercises, calmed themselves through yoga and reduced their own stress. The Mary Lou Fulton Teachers College Preschool has three classrooms that include a total of 40 children ranging in age from 3 to 5 years. Preschool students are placed in a classroom based on the “best fit” approach in which the staff and director consider many factors, such as age, teachers’ expertise and children’s strengths and needs. In the past year, the preschool hosted more than 100 college students from programs in early childhood, special education, occupational therapy, speech and hearing sciences, nursing, nutrition and health promotion, university service learning, dance, drama and music therapy. Preschool openings are available to children regardless of whether parents or guardians have an affiliation with the university. Located on ASU’s Tempe campus, the school is open 12 months per year, Monday through Friday from 7:30 a.m. to 5:30 p.m. A few openings remain for fall 2016. 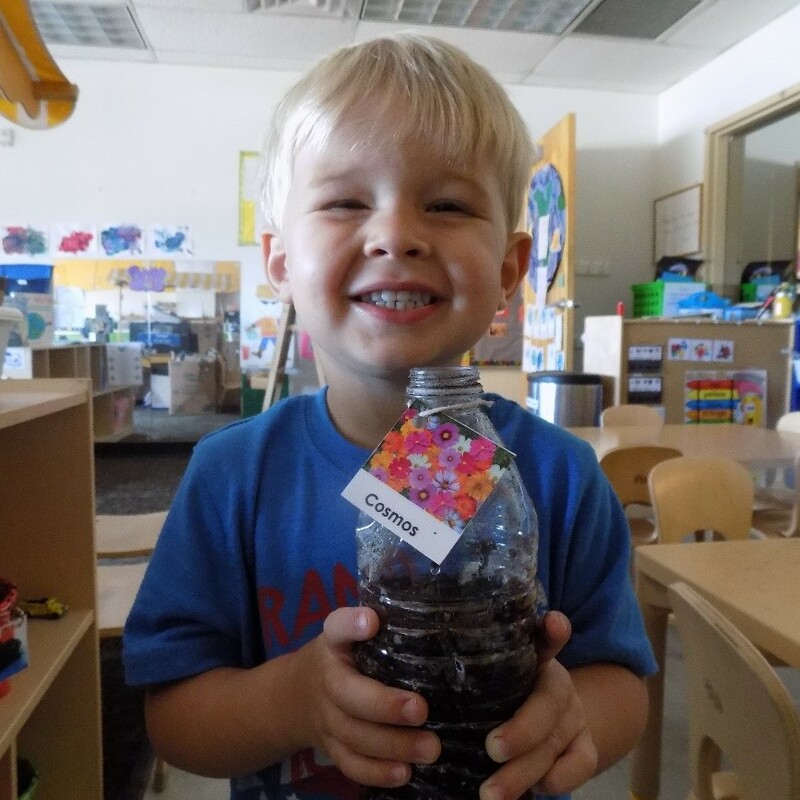 Interested families should contact the Mary Lou Fulton Teachers College Preschool at preschool@asu.edu or 480-965-9396 to learn more and set up a tour. To learn more about the preschool and the sustainability education happening there, view the video below or visit Mary Lou Fulton Teachers College Preschool. To learn more about sustainability education at ASU, visit ASU’s Sustainability Science Education team at the Biodesign Institute. Among the valuable holdings in London’s Wellcome Library is a rough pencil sketch made in 1953 by Francis Crick. The drawing is one of the first to show the double-helix structure of DNA — nature’s blueprint for the design of sea snails, human beings and every other living form on Earth. In new research appearing in the advance online edition of the journal Science, Arizona State University researcher Hao Yan and colleagues from MIT and Baylor College of Medicine describe a new method for designing geometric forms built from DNA. They present a novel variant on a technique known as DNA origami, in which the base-pairing properties of DNA are exploited for the construction of tiny structures in two and three dimensions. “An important challenge in the field of DNA nanotechnology is to design any desirable structures in a top-down manner, without much human input concerning details of DNA strand folding paths,” Yan said. His collaborators at MIT, led by Mark Bathe, developed a computer algorithm to design DNA nanostructures by only inputting a target shape. They engineered a software platform that can compute and output necessary DNA strands to form designer architectures. Formation of these structures were then systematically characterized and confirmed experimentally at the three institutes. “This really showcases interdisciplinary collaborative science across the country,” said Yan (pictured left), who directs the Biodesign Institute’s Center for Molecular Design and Biomimetics at ASU. The team designs useful structures at an astonishingly minute scale. (One nanometer is a billionth of a meter, or about the size of a sugar molecule.) Specialized imaging techniques, including atomic force- and cryo-electron microscopy, are used to visualize the resulting forms. The simplified technique described promises to significantly extend the use of DNA origami beyond the specialist community and expand the range of possible applications in biomolecular science and nanotechnology. These include the use of nanoparticles for drug delivery and cell targeting, construction of nanoscale robots capable of performing diverse activities in medicine and industry and the design of custom-tailored optical devices. The new design method, which can produce virtually any polyhedral shape, relies on a top-down strategy, which begins with an outline of the desired form and works backward in stages to define the required DNA sequence that will properly fold to form the finished product. The autonomous process is carried out using a software program designed by the authors. Known as DAEDALUS (for DNA Origami Sequence Design Algorithm for User-Defined Structures), the program carries out inverse design of arbitrary DNA origami nanoforms, based on an ­­input wireframe mesh (a visual representation of the closed, 3-D geometric surface). The program is not only user-friendly, but highly versatile, producing forms not limited to spherical topology (i.e., closed, two-sided structures with no boundaries or holes). Once the target form has been described as a network of nodes and edges, DNA scaffold strands of custom length and sequence are generated using technology known as asymmetric polymerase chain reaction. The new study describes the fabrication of a variety of geometric DNA objects, including 35 polyhedral forms (Platonic, Archimedean, Johnson and Catalan solids), six asymmetric structures and four polyhedra with nonspherical topology, using inverse design principles. The method can produce nanoforms with high fidelity and stability without the normal laborious process of manually designing base pairs to form the intended target structure. DNA origami brings the ancient Japanese method of paper folding down to the molecular scale. The basics are simple: Take a length of single-stranded DNA and guide it into a desired shape, fastening the structure together using shorter so-called staple strands, which bind in strategic places along the longer length of DNA. The method relies on the fact that DNA’s four nucleotide letters — A, T, C and G — stick together in a consistent manner; As always pairing with Ts and Cs with Gs. The DNA molecule in its characteristic double-stranded form is fairly stiff, compared with single-stranded DNA, which is flexible. For this reason, single-stranded DNA makes for an ideal lace-like scaffold material. Further, its pairing properties are predictable and consistent (unlike RNA, which is considered promiscuous, due to base pairings that may be unexpected). The technique has proven wildly successful in creating myriad forms in two and three dimensions, which conveniently self-assemble when the designed DNA sequences are mixed together. The tricky part is preparing the proper DNA sequence and routing design for scaffolding and staple strands in order to achieve the desired target structure. Typically, this is painstaking work that must be carried out manually. With the new technique, the target structure is first described in terms of a wire mesh made up of polyhedra. 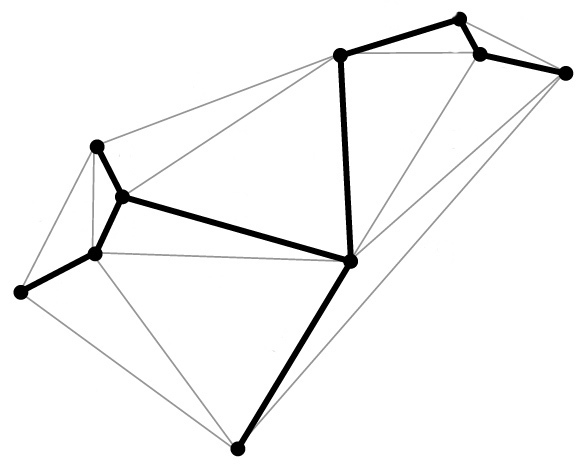 From this, a spanning tree algorithm is generated. This is basically a map that will automatically guide the routing of the DNA scaffold strand through the entire origami structure, touching each vertex in the geometric form once. Complementary staple strands are then assigned, and the final form self-assembles. To test the method, simpler forms known as Platonic solids were first fabricated, followed by increasingly complex structures. These included objects with nonspherical topologies and unusual internal details, which had never been experimentally realized before. The completed designs demonstrated the ability of the top-down technique to automatically generate scaffold and staple routings for an expansive range of nanoforms, based solely on surface geometry. Cryo-EM was used to confirm structural fidelity and stability of the assembled origami structures. Further experiments confirmed that the DNA structures produced were potentially suitable for biological applications as they displayed long-term stability in serum and low-salt conditions. The research paves the way for the development of designed nanoscale systems mimicking the properties of viruses, photosynthetic organisms and other sophisticated products of natural evolution. In addition to his appointment at the Biodesign Institute, Hao Yan is the Milton D. Glick Distinguished Professor in the School of Molecular Sciences, in ASU’s College of Liberal Arts and Sciences.